We regularly inspect our clients' assets to ensure that graffiti is dealt with in a timely manner, as studies have shown that the best strategy is to remove graffiti as soon as possible (within the first 48hrs), as it reduces the chance of future attacks. 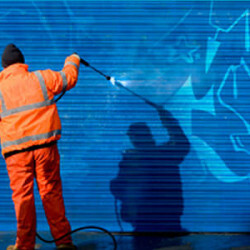 With over 20 years experience in graffiti removal Corporate Clean Property Services can provide a solution to any method of graffiti on any surface (including wood, concrete, brick, render, glass, metal, painted surfaces, etc.). Corporate Clean Property Services uses the latest technology, tools, and solutions to provide a quick and efficient graffiti removal service using environmentally friendly methods. The solutions we use are biodegradable and non-toxic, and assist us in achieving a high quality result in a large variety of situations. We can also apply these solutions using pressure cleaning or by hand to ensure that we leave no trace of the graffiti, without harming the surface. Should You Remove or Paint Over Graffiti? There is a large difference between removing graffiti and simply painting over graffiti. Often ‘paint out’ methods result in a patchy appearance and only look marginally better than the graffiti, with high frequency strike-spots ending up with multiple layers of peeling paint. Although many graffiti attackers use spray cans for tagging or defacing, markers, crayons, permanent paint/pens, chemicals, wax, and others mediums are also used.